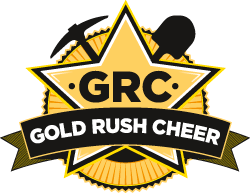 GOLD RUSH CHEER is a community based cheerleading gym that promotes the amazing athletic sport of cheerleading! Our cheerleading program is designed to promote pride, passion and sportsmanship as well as encouraging fun, fitness and friendships. Our Mission at GOLD RUSH CHEER is to help every athlete have fun, work hard to reach not only their goals but the squads goals too, make friends and build self-confidence. Ensuring this in a positive safe working environment, learning new cheers, gym, jumps and stunts! Our programs cater for a range of ages from 3 years old and up, offering performances at community events, team bonding activities and travelling to Perth for regional and national competitions ensuring every athlete has the opportunity to live their cheer dreams and reach their full potential. We teach our cheerleaders to have great team spirit on and off the floor, including everyone, being kind, friendly helpful athletes that we are proud of! We look forward to welcoming you into our gym and become part of the GOLD RUSH family!